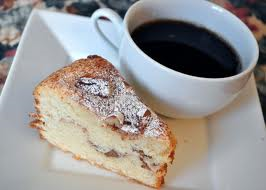 It’s interview time again, and today I’m pleased to have the lovely Carol Cooper dropping by for coffee and cake. Why not take five minutes to join us? I wanted to write the kind of novel that I enjoy reading myself, with a diverse cast of characters, each one complex and flawed, with problems and dreams that people can identify with. Chef Dan, for instance, is on the up, with a new job in a trendy Hampstead bistro. But his partner Laure is wrapped up in their young son and has no time for him. You can tell that’ll lead to trouble. Do you model any of your characters on people you know? If so, do these people see themselves in your characters? 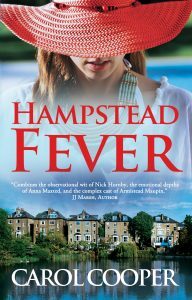 In Hampstead Fever, as in my first novel, I’ve used my imagination to create the characters. But I’ve been inspired by real people, including the patients I look after in my other life as a doctor. I’d be lying if I said anything else. Writers can’t help being influenced by what’s around them, just like everyone one. It was a lightbulb moment when I learned that everything you ever see, hear, or experience creates new connections between brain cells. Basically, daily life subtly changes the anatomy of your brain. The only characters who are modelled on real people are Laure’s aunts, who are like my own great-aunts, two wonderful individuals who seemed to be crying out to be put in a book. They’re no longer with us, so they can’t read my book. I used the internet to look up details like bus routes to make sure characters are going home in the right direction, and I’ve checked which songs hit the charts when. That’s important for Sanjay, who loves music. I also hung around Hampstead village a lot, which is no hardship because I live nearby and it’s a lovely area. There’s a lot I didn’t need to look up, like the medical details that appear in part of the story. That’s stuff I knew already. Which point of view do you prefer to write in, and why? The third person, but it‘s a deep and intimate third person. Hampstead Fever evolves from each of the six main characters’ viewpoint, and each scene takes you right into the mind and heart of that one person. I think I write multi-viewpoint fiction because for most of my working life I’ve tried getting inside other people’s heads. As a GP, every ten minutes I see someone with a new story and a different perspective. A bit of both. I like to have the gist before I begin, but then the characters grow and take over, telling lies, jumping into bed with the wrong people, and generally getting into trouble that I hadn’t anticipated. Rick Stein to supply me with fish and seafood dishes, Barack Obama for brilliant conversation, and hairdresser Nicky Clarke to make my hair look great. 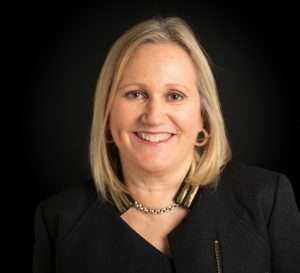 Bio: Carol is a journalist, author and doctor. She graduated in medicine from Cambridge University. To support her studies, she worked at supermarket checkouts, walked dogs, typed manuscripts in Russian, and made men’s trousers to measure. After a string of non-fiction books, including an award-winning textbook, she turned to fiction with her debut novel One Night at the Jacaranda. She is president of the Guild of Health Writers and has three amazing grown-up sons. Like her fictional characters, she lives in Hampstead and Cambridge. Unlike them, she remarried in 2013. She likes a happy ending. Thank you ever so much Carol. A fantastic interview!